As we finish out the 2016-2017 school year, we are looking ahead to next year and planning our marching season. The Arcola High School Band Camp for grades 9-12 will be held July 31st - August 4th, from 8 am - 3 pm daily. This camp is mandatory for all band students grades 9-12 for the 2017-2018 school year. Camp is a lot of fun! The students learn their marching drills, we learn to play our music together, and we practice in sections. We are also considering holding a "Rookie Camp" for all incoming freshman on July 27-28th. And we might throw in a couple night practices. We are hoping to have everything finalized in the next couple weeks. For now, please keep this week free. In addition, all students will be sent home with their music at the end of the school year. Please encourage them to practice over the summer, so when band camp rolls around we'll be ready and prepared to get to work! More information, and a schedule will be sent home. FYI: Did you know the AHS band camp is held the one week that AHS Football team has off? This is so we have access to our practice field (also the football's practice field), and also so our band students who are football players can also attend band camp. It's consistently held the last week of July and/or the first week of August. As summer approaches you are probably planning things for your students to be involved in. Area band camps and clinics are a great way to spend a week or two in the summer building music and leadership skills. Two particular ones in the area that are fantastic are held just 30 minutes away in Charleston, on the campus of EIU. Each summer our drum major & color guard captain attend the Smith Walbridge Clinic. Several students in the past have also attended the marching and leadership clinics. 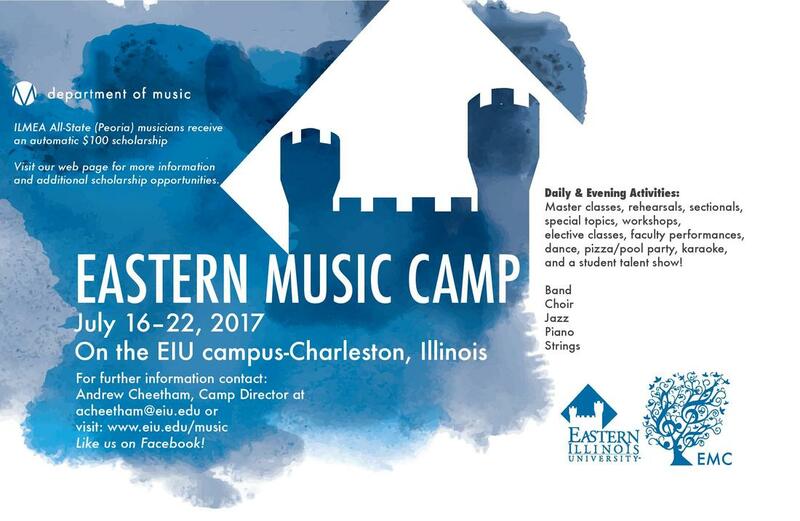 Another fantastic music camp is not a marching camp, but the Eastern Music Camp held July 16-22nd. This Eastern camp is not only for high schoolers, but also junior high. There are several sections this camp as well including: Junior/Senior Band, Choir, Jazz, Piano & Strings. If your student is a current 7-11th grader, they are allowed to use any money in their personal account for these camps. They may also be eligible for a small scholarship from our boosters. Below is information regarding each camp. Please speak to Mr. Mueller if you have any questions or would like to attend one of these camps this summer. 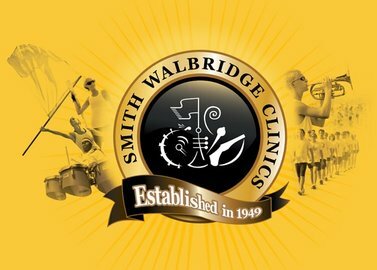 The Smith Walbridge Clinics at Eastern Illinois University in Charleston, IL includes several different clinic sessions weekly during July 9-21st. Sessions include clinics for: drum majors, color guards, marching percussion, marching bands, student leaders, marching band directors, drill designers and mace / signal batons. Over 1100 college and high school students and directors from across the nation and several foreign countries attend each summer. The president and director of Smith Walbrige Clinics is the Marching Illini director, Barry Houser. These clinics are exceptional at building leadership, marching and drum major skills. More information regarding SWC can be found here. Many families have been asking for general information about the camp, so we've created a document that will answer many of your questions. Download EMC 2017 General Information here! Traditional Application. If you prefer to print and mail your application along with a check for payment, click this link and follow the instructions in the PDF document that downloads to your computer. EMC 2017 General Scholarships have been announced by email. To the many campers who applied for scholarships, thank you for taking the time to apply. Everyone who applied has now been notified of whether or not they were selected for a General Scholarship, provided we had a legible email on the application. Please feel free to contact the Director (below) if you have any questions about your scholarship application. Feel free to contact the Director with any questions at the information below and please follow us on Facebook! 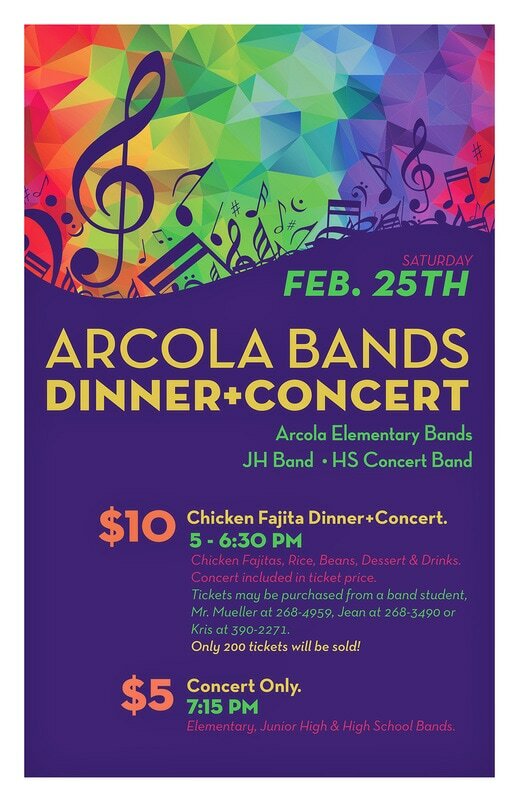 This year’s Dinner Concert featuring Arcola Bands, grades 5th-12th, will be held Saturday, February 25th. We are excited to announced that we will be serving an authentic chicken fajita dinner, complete with rice, beans, dessert and drink, this year. ADMISSION: DINNER+CONCERT will be $10 in advanced sales OR you can just enjoy the concert for $5. Children ages 5 and under is free. Band students eat for $5. 18th. Your tickets will be mailed to your home prior to the concert. If we run out of tickets, your money will be refunded and you may purchase concert tickets at the door. If we do not reach 200 in advanced sales, we will sell tickets at the door and/or “seconds”. SIGN UP SHEET: Please volunteer! This is the band’s largest fundraisers and it takes many parents to make it successful. Shifts are short, and we promise that you won’t miss your student playing. DESSERTS: All students in grades 5th-11th are asked to bring a dessert to be served at the dinner. You may send your dessert to school with your student on Friday the 24th or deliver it to the cafeteria on Saturday the 25th after 12 pm. We need all desserts no later than 4:00 pm, please. We request that desserts are not pre-packaged and they can not require refrigeration. If you have any questions please contact Mr. Mueller at the school, Kris Bott (390-2271) or Jean Fulton (268-3490). Below is a list of scales to pass off each week for the rest of the quarter. Deadline for each week is Sunday at 11:59pm. Your student was given their high school band handbook at the beginning of the year. It contains a lot of valuable information. If you didn't receive it, please download the PDF. Chair auditions are Tuesday November 12th-14th. congratulations pride of the purple riders! 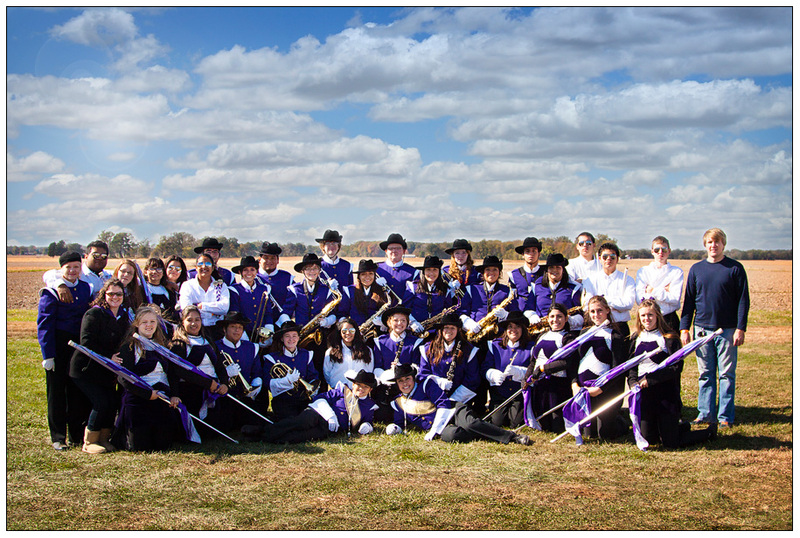 Congratulations to the Pride of the Purple Riders Marching Band on ending their marching season on a "Spooktacular" note! The Pride of the Purple Riders had a very successful day on Saturday the 26th at the 18th Annual Oblong Spooktacular Band Fest Competition and Nighttime Parade, performing their marching show "Queen." In class A they placed 3rd in percussion and auxiliary, 2nd in drum majors and 1st place over all. They also won the "viewers choice" award. They placed 1st in drum majors, 2nd in auxiliary, and 3rd over all in the parade. Just a point and a half separated the 1st and 3rd place winners in the nighttime parade. ABBA is selling yard signs to raise money for new percussion instruments. Signs are about an 18x24, and are only $30! We will be placing two separate orders. One will be taken until Monday night at 9 pm, orders placed by this date will have delivery from Broom Corn weekend. The second order will be placed September 16th, with delivery before homecoming (Oct. 5th). To place your order please email or call Kris Bott at 390--2271 / krisbott@gmx.com. Our first football game is next Friday, September 6th! The band boosters (if you're a band parent, that's you), we run a concession stand at every home football game. 100% of the profits from the concession stand go directly to the band. This helps purchase new instruments, clean uniforms, purchase much, supplies, transportation for band events and trips, plus much much more! It is by far the biggest fundraiser the band holds each year. To run this though, we need EVERY parent to help. We have a lot of workers signed up for the first game, however, only a couple signed up for the rest of the season. We still need workers for October 5th, October 11th and October 25th. The shifts are for one evening, they start at 6 pm and end around 9 pm. If you need to be slightly late, that's perfectly fine! If you are able to work please call Kris Bott at 390-2271. 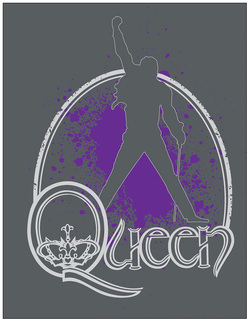 We are excited to finally show you the Queen shirt design! The shirts will be the vintage shirts like the Monty Python shirts last year, but in a dark grey. Front graphic with the band's performance schedule on the back. Adult sizes S-XXL. If you're in question about the size, consider going up a size. These vintage shirts run a little more fitted. Shirts are $12. Order forms & payment is due to Mr. Gore by FRIDAY, AUGUST 23rd. You can pick up an order form in the band room OR you can download one here. Please contact Kris Bott with any questions. 217-390-2271 or krisbott@gmx.com. This summer, we are strongly encouraging incoming 9th-12th to attend a summer band camp at ISU or to attend the Smith Walbridge Camp at EIU. Both camps provide an incredible learning and social experience for Arcola students. Students have opportunities to improve musicianship, marching, maturity, and responsibility within the band. You may find more information regarding these camps by visiting the following websites: summersymposium.illinoisstate.edu or swclinics.com. The Arcola Band Boosters have agreed to pay a portion of each student’s enrollment fee. The amount will be based on how many participants. Please contact Mr. Gore for more information & before enrolling in a summer camp. The High School LOVC date previous published on the band's and school calendars is incorrect (March 14th). The actual date is Thursday, March 21st in Martinsville. More information to come. We are very excited to be offering the band a new fundraiser this spring. The Butter Braid® & Cookie Dough fundraiser will run from February 19 - March 5th. Delivery of these items will take place on Monday, March 18th, just in time for Easter! Money is due at the time of order. All checks should be made out to ABBA and accompany your order form in the envelope provided. PLEASE make sure your name is on the your order form. Orders submitted without money will not be placed. Orders turned in late run the risk of not being ordered. Profits for grades 5-6th grade will go into a general band fund. This fund helps purchase new instruments, repair old one, purchase music, help fund transportation for trips and much , much more! PRIZES will be offered to the top THREE sellers in 5th & 6th grade. Top sellers will receive a gift card to the store of their choice. Top selling student will receive a $30 gift card, second $20 and third $10. For grades 7-12, profits from this fundraiser will go into YOUR student account. This money may be used for trip fees, camp fees, instrument supplies and even uniform needs. Please keep in mind in 2015 the marching band is scheduled to march at Walt Disney World. (Students participating are in 7-10th right now.) We encourage you to start saving now for this trip. The Musical Dinner Concert is scheduled for this Saturday, February 23rd. Students grades 7-12 are asked to report to the high school gym at 9 am on Saturday morning to help set up tables and chairs, bring a parent and it will go faster! We should finish between 10-10:30 am. At 10:30 we will start decorating the gym, anyone wanting to help is welcome to join. We have almost filled up our schedule. THANK YOU to those who have already volunteered. We still need 3-4 more people to work between 6:15-7 pm. Please contact Kris Bott at krisbott@gmx.com or at 390-2271 if you're able to work during this time. You WILL NOT miss your child playing. We also need all parents to donate a homemade dessert (nothing that needs refrigeration.) Pies, cakes, cookies, brownies or cupcakes are PERFECT. Desserts may be brought to school on Friday, the morning of set up, OR may be dropped off between 2:30-4 pm on Saturday. will relocate to the junior high gym. Your student will be bringing home a new spring fundraiser this week. We're starting it slightly earlier than typical because we want our orders to arrive prior to Easter. We’re very excited to be trying something new. The Butter Braid® & Cookie Dough fundraiser will run from February 19th - March 5th. With delivery of items on Monday, March 18th, just in time for Easter! Money is due at the time of ORDER. All checks should be made out to ABBA and accompany your order form, in the envelope provided. PLEASE make sure your name is on your order form. Orders submitted without money, will not be placed. Orders turned in late run the risk of not being ordered. Please encourage your student participate in this fundraiser. Fundraisers are essential for the band to get new instruments and supplies. Each student’s goal is to just sell 10 items. We profit 40% from this fundraiser. GRADES 7-12: Profits from this fundraiser will go into YOUR student account. This money may be used for trip fees, camp fees, instrument supplies and even uniform needs. Please keep in mind in 2015 the marching band is scheduled to march at Walt Disney World. (Students participating are in 7-10th right now.) We encourage you to start saving now for this trip. GRADES 5 & 6: Profits from the 5-6 grades sales will go into the general band fund. This fund helps purchase new instruments, repair old instruments, purchase music, help fund transportation for trips, and much, much more! PRIZES!!!!! TOP THREE SELLERS in grades 5 & 6! The prize is a gift certificate to the store of the winners choice! The top seller will receive $30, second $20 and third $10. Pep Band & Winter Guard senior night will be held Friday, February 15th. The seniors that participated in pep band will be announced with their parents prior to the start of the varsity game. It is requested that all parents and seniors arrive prior to the end of the JV game. High school and junior high band students should be practicing at home several times each week. We have an important scales test coming up the week of March 4th. This is the biggest grade of the quarter and students need to start preparing at home. The selections for the dinner concert this year are quite difficult. In order to play these pieces successfully, all students need to be accountable for their own parts. Reviewing difficult passages at home will ensure that we can have more productive rehearsals and that we will have more time to focus on the expressive elements of our music making. Please keep in mind: A student who practices quickly learns slowly. A student who practices slowly learns quickly. Calling all Arcola Band Alumni of all ages! The alumni pep band night will be held Friday, February 1st. We will meet in the band room at 6:30 pm, and have light refreshments after the game. Join us as we play some awesome music, and cheer on the Lady Riders. Contact Mr. Gore at 268-4962 for more information. Attention band students grades 5-12 - If you sold fruit, it will be delivered on Monday, December 17th. Pick up times are between 4:30-6:00 pm. Items can not be left in the band room, so please make arrangements during this time to pick up your fruit. WE NEED YOUR HELP: Fruit will be delivered at 3 pm in the band room. We need parents and students to help unload the truck, sort the fruit and then pass out the fruit to students. We will need volunteers between 3-6:00 pm. If you're able to help, please contact Kris Bott at krisbott@gmx.com or 217-390-2271. Thanks! Musictheory.net has great step by step lessons and customizable lessons and the rhythm trainer will help with recognizing and counting rhythm. If you know any other great resources, please share! The junior high band festival is tomorrow, November 1st, at Atwood. Junior high students will leave the school tomorrow after 3rd hour. Rehearsal is from 1-6 and the concert is at 7. Students: bring a change of dress clothes. No jeans or tennis shoes. Check with your teachers on what you will miss before you leave tomorrow. PARENTS: The paper I sent home yesterday is incorrect. The concert is at 7 not 7:30. If your student is riding home with you, I need a note by tomorrow morning. This morning we had our last marching band rehearsal outside! We have had a fun year out on the field and have seen some significant growth in individual and ensemble playing. I am looking forward to an awesome day at Oblong Saturday. Parents, our fall newsletter went home today so expect to receive this from your students today. CORRECTION: The Veteran's Assembly is Friday, November 9th, not the 12th. The band will prepare the usual Marches of the Armed Forces and something a little different this year! Next week marks the beginning of the concert band and pep band seasons. Chair audition music has been passed out (passed out week 9). Students will have 5 minutes to play a selection from both audition pieces and sight read. This audition is worth 80 points. Auditions are November 12th 13th, and 14th during 1st hour. Order will be random so be ready to play on Monday! Below you will find a file of the band audition rubric. Please bring this to your audition to avoid any unnecessary delays. Also coming up, students need to have their instruments cleaned by Wednesday, December 5th. Please do not wait until the last minute on this. After cleaning your instrument, it will play slightly different than you are used to. We want to avoid any last minute surprises before the concert. This time of year is dedicated to creating an ensemble sound much different than out on the marching field. We do a great deal of sight reading to increase our reading abilities and for exposure to styles of literature we do not see in the band repertoire. During this time, we will spend some time reading and listening to The Planets by Gustav Holst. So very excited for concert band season to start! Keep practicing and listening! The Oblong Spooktacular competition on October 27th will be the marching band's last performance of the year. We will leave at 8 am and return around midnight. Arcola's performance time is 11:30. The drum line showcase is from 2:45-3:45 and the field show awards will follow. Night-time parade line up is at 6 pm, with the parade starting 7 pm. Parade awards on the football field to follow the parade. Times are subject to change, plan to arrive a little early. Please make sure your student brings black socks and warm clothes (weather depending), we will be outside all day. You will also need to either bring your meals or money for concessions. They can also bring glow-sticks to decorate their instruments for the parade. There will also be commemorative shirts available to purchase. Short sleeve shirts are $10, long sleeve $15, Crew neck sweatshirt $17 and hooded sweatshirts $25. They are available in youth and adult sizes, and do tend to sell out quickly. Any questions or if you'd like to help chaperone this trip please contact Mr. Gore. Jolesch Photography photographed our band at the EIU Band Festival a couple weeks ago. They not only have some group pictures, but also picture of each student while performing their field show. These photos may be purchased by clicking on this link: http://www.jolesch.com/csEventPhotoBrowse.aspx?EventID=97941&Group=78164&Cat=0&PartID=0. Here you will find information about all Arcola Bands grades 5-12. Please check back often!